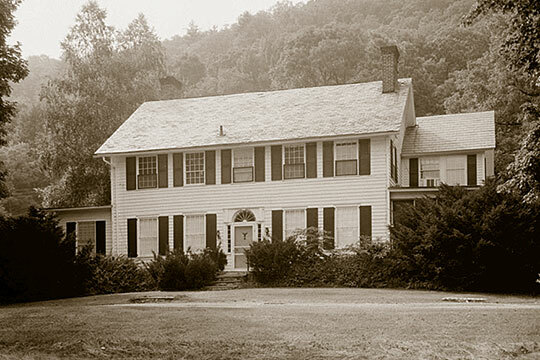 Photo: William Nyce House (Eshbach House), ca. early 19th century, Route 209, Egypt Mills, Lehman Township, Pike County, PA. The Nyce Farm was listed on the National Register of Historic Places in 1979. Photographed by George Eisenman, 1970, Historic American Buildings Survey [HABS PA-1163], memory.loc.gov, accessed October, 2014. Pike County Courthouse and county administrative offices are located at 506 Broad Street, Milford PA 18377; phone: 570-296-7613. Pike County was formed March 26, 1814 and named for General Zebulon Pike who was killed in Canada in 1813. As the act creating the county provided that Milford could only be the county-seat on condition of the payment of at least fifteen hundred dollars by her people towards the erection of public buildings, they went immediately to work and raised that sum. The work of erecting a courthouse was begun in 1814 and the stone building still standing and used as a jail was completed in 1815. It was substantially constructed of native boulders hewn square on the outer side. The contractors were Dan Dimmick, Jacob Quick and Samuel Anderson. At first there was no bell upon the courthouse, and when the judges and lawyers and persons interested were to be summoned, the sheriff mounted the cupola and blew most piercing blasts upon a huge tin horn. This was superceded by a huge triangle, upon which the sheriff or a tipstaff dealt resounding blows that were not unmusical, and this, in turn, gave way in 1844 or 1845 to the bell which for many years announce at proper seasons that justice was about to be judicially administered. Fluhr, George J., Pike County Historian, Pike County Courthouse, Milford PA, nomination document, 1978, National Park Service, National Register of Historic Places, Washington, D.C.